The R Consortium ISC is pleased to announce that the projects listed below were funded under the 2017 edition of the ISC Funded Projects program. This program, which provides financial support for projects that enhance the infrastructure of the R ecosystem or which benefit large segments of the R Community, has awarded $500,000 USD in grants to date. The Spring 2018 call for proposals is now open and will continue to accept proposals until midnight PST on April 1, 2018. Learn more about the program and how to apply for funding for your project. The ‘units’ package has become the reference for quantity calculus in R, with a wide and welcoming response from the R community. Along the same lines, the ‘errors’ package integrates and automatises error propagation and printing for R vectors. A significant fraction of R users, both practitioners and researchers, use R to analyse measurements, and would benefit from a joint processing of quantity values with errors. The Simplified Wrapper and Interface Generator (SWIG) is a tool for automatically generating interface code between interpreters, including R, and a C or C++ library. The R module needs to be updated to support modern developments in R and the rest of SWIG. This project aims to make the R module conform to the recommended SWIG standards and thus ensure that there is support for R in the future. We hope that this project will be the first step in allowing SWIG generated R code using reference classes. The objective of the Future Framework implemented in the future package is to simplify how parallel and distributed processing is conducted in R. This project aims to provide a formal Future API specification and provide a test framework for validating the conformance of existing (e.g. future.batchtools and future.callr) and to-come third-party parallel backends to the Future framework. The stars project enables the processing Earth imagery data that is held on servers, without the need to download it to local hard drive. This project will (i) create software to run a back-end, (ii) develop scripts and tutorials that explain how such a data server and processing backend can be set up, and (iii) create an instance of such a backend in the AWS cloud that can be used for testing and evaluation purposes. The first ISC Call for Proposals for 2018 is now open. We are looking for ambitious projects that will contribute to the infrastructure of the R ecosystem and benefit large sections of the R community. However, we are not likely to fund proposals that ask for large initial cash grants. The ISC tends to be conservative with initial grants, preferring projects structured in such a way that significant initial milestones can be achieved with modest amounts of cash. As with any proposed project, the more detailed and credible the project plan, and the better the track record of the project team, the higher the likelihood of receiving funding. Please be sure that your proposal includes measurable objectives, intermediate milestones, a list of all team members who will contributing work and a detailed accounting of how the grant money will be spent. But, most importantly – don’t let this talk of large projects dampen your enthusiasm! We are looking for projects with impact, regardless of their size. With this call for proposals, we are hoping to stimulate creativity and help turn good ideas into tangible benefits. Look around your corner of the R Community, what needs doing and how can the R Consortium help? Please do not submit proposals to sponsor conferences, workshops or meetups. These requests should be sent directly to the R Consortium’s R User Group and Small Conference Support Program. To submit a proposal for ISC funding, read the Call for Proposals page and submit a self-contained pdf using the online form. You should receive confirmation within 24 hours. The deadline for submitting a proposal is midnight PST, Sunday April 1, 2018. The 2018 R Consortium R User Group Support Program is Underway. In just one year, the R Consortium through the R User Group Support program sponsored 76 R user groups and 3 small conferences with cash grants totaling just under $30,000. This program aligns with the R Consortium mission of fostering the continued growth of R community and the data science ecosystem, and has already helped bring more people to using R and contributing to the community. Coming off a successful 2017, we are pleased to announce the opening of the 2018 program today. While the structure of the 2018 program is similar to last year’s program with the multiple levels of support, we have enhanced the program based on feedback from last year’s funded user groups. After a year of supporting user groups, we’ve found that the primary cost for each group is having a page on meetup.com or thier own website ( though the majority prefer the meetup.com platform ). This leaves less funds available things like meetup space, food, or even swag, and thus put more of a burden on the group leaders to attract people to the group. This year we’ve leveraged our relationship with the Linux Foundation, and now will provide each user group a complimentary meetup.com Pro account. Leveraging this not removes one less cost concern for group leaders, but it will also better enable us to promote user groups through the many features the platform provides for groups. For all the details of the program, eligibility requirements for the three levels of user group grants, the schedule of grants and the details of signing up for the meetup.com pro account please see the R Consortium’s R User Group Support Program webpage. We’ve also seen an increase in the number of smaller, regional focused R conferences happening around the world. 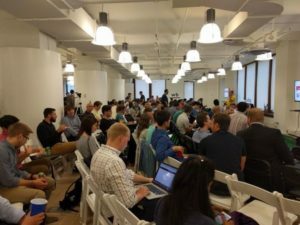 Grassroots events like this are critical for sustainability in the R community, but need financial support and community awareness to be successful. Several reached out last year and we provided funding with excess funds in the program with great results. 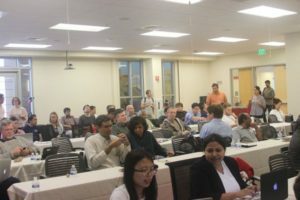 These events perfectly align with the mission of the R User Group Support program, we’re formally expanding it this year to provide cash grants in the $500 to $1,000 range to continue to encourage small, R-focused conferences and meetings organized by non-profit or volunteer groups are the world. You can find out more about this new piece of the program on the R Consortium’s R User Group Support Program webpage. R Consortium will begin taking applications for both R User Group Support and Small Conference Support today. Applications will be accepted through September 30, 2018. Apply to the 2018 RC RUGS program by filling out this form. You can email us at rugs@r-consortium.org with any questions around the program. 1 Silver Member Board Director per every 7 Silver Members, subject to provisions 4.2 and 4.3(d) of the R Consortium ByLaws. This means the Silver Member class can elect up to 2 Board Directors representing the class. These elections ran during the month of November 2017, with 3 nominees for Silver Member Board Director and 3 nominees for the Silver Member ISC representative. I am pleased to announce those elected by the Silver member class to serve on the Board of Directors and ISC effective 1/1/2018 through 12/31/2018. Please join me in congratulating each of the elected representatives. We would also like the share a big thank you to the outgoing Silver Member Board Director Richard Pugh of Mango Solutions. His guidance and leadership within the R Consortium have made a huge impact on its current success. The second and final ISC Call for Proposals for 2017 is now open. In this round, with the intention of spreading the available funds as widely as possible, the ISC is encouraging the R community to submit proposals for projects that are smaller in scope than those solicited earlier this year. For this round, the total funds requested for an individual grant should be less than $10,000. Look at the Simple Features Project as an example of what can be achieved with this level of funding. Note that the current funding cap should not discourage anyone with plans for a more ambitious project. The ISC tends to be conservative with initial grants for large projects. So, framing your initial proposal as a “proof of concept” or “initial objective” of a large project – with an estimate of the total project cost – will not necessarily slow down the work. As always, proposals should clearly describe the problem that needs to be solved, and be likely to have an impact on a broad segment of the R Community. Keep in mind that the ISC generally does not fund projects that apply to a limited geographic region, or a very specialized domain. Please do not submit proposals to sponsor conferences, workshops or meetups. The R Consortium is in the process of establishing a “Marketing Committee” reporting directly to the Board of Directors, for this purpose. Until the Marketing Committee establishes a more formal procedure, please send your request for a conference or meeting sponsorship to me, joseph.rickert@rstudio.com, and I will see that it gets forwarded to the committee. The R Consortium and ISC are proud to report that, so far, we have awarded nearly half a million dollars in grants. With your help, we can continue this pace in the future. We need solid, well thought-out proposals. Act now! Submit a proposal using this form. The current call for proposals will end at midnight PST on September 15, 2017. Take the R Consortium’s Survey on R! Help us keep the conversation going: Take the R Consortium’s Survey. Let us know: What are you thinking? What do you make of the way R is developing? How do you use R? What is important to you? How could life be better? What issues should we be addressing? What does the big picture look like? We are looking for a few clues and we would like to hear from the entire R Community. The R Consortium exists to promote R as a language, environment and community. In order to answer some of the questions above and to help us understand our mission better we have put together the first of what we hope will be an annual survey of R users. This first attempt is a prototype. We don’t have any particular hypothesis or point of view. We would like to reach everyone who is interested in participating. So please, take a few minutes to take the survey yourself and help us get the word out. The survey will adapt depending on your answers, but will take about 10 minutes to complete. The anonymized results of the survey will be made available to the community for analysis. Thank you for participating. 现在进行调查！ 今すぐ調査をしてください！ Participez à l’enquête en ligne! ¡Tome la encuesta ahora! SAN FRANCISCO – [Jan 11, 2017, 10:00 ET] – The R Consortium, an open source foundation supporting the R user community and a Linux Foundation project, today welcomed the Gordon and Betty Moore Foundation to the Consortium as a supporting Platinum member. The Moore Foundation grant will enable the R Consortium to expand its support for the community developing, maintaining, distributing and using the R programming language. Thousands of statisticians, analysts and scientists worldwide rely on the R language to allow them to analyze, model and visualize large, complex datasets and to create statistical software. In addition, R provides interfaces to other computing platforms, providing users with access to the best computations for understanding data. Interest in the language is growing across industries that rely on statistical computing, such as healthcare and finance, as well as newer disciplines like machine learning. The Moore Foundation was established to create positive outcomes for future generations. In pursuit of that vision, the Foundation fosters path-breaking scientific discovery, environmental conservation, patient care improvements and preservation of the character of the San Francisco Bay Area. As part of its work to support scientific discovery, the Moore Foundation has a $60 million initiative in Data-Driven Discovery that supports new ways to effectively harness scientific datasets that are so large and complex that they require use of fundamentally different techniques and better tools. Participation in the R Consortium is a part of the Moore Foundation’s efforts to encourage progress in data science practice. Mr. Mentzel will participate in meetings of the Board of Directors and the Infrastructure Steering Committee (ISC), which provides support and technical guidance to the R community. The infrastructure Steering Committee is now accepting proposals for the first round of funding in 2017. The ISC is broadly interested in projects that will make a difference to the R community. Ambitious technical projects such as R-hub, which require dedicated time to supply infrastructure that is currently missing in the R ecosystem. Community projects like R-ladies and SatRdays, which help catalyze and support the growth of the R community around the world. Smaller projects to develop packages similar to DBI and sf, which provide key infrastructure used by thousands of R programmers. The deadline for submitting a proposal is midnight PST on Friday February 10, 2017. For information on the mechanics of submitting a proposal and some guidance on how to write a good proposal, see the Call for Proposals page. The R Consortium is a 501(c)6 nonprofit organization and Linux Foundation project dedicated to the support and growth of the R user community. The R Consortium provides support to the R Foundation and to the greater R Community for projects that assist R package developers, provide documentation and training, facilitate the growth of the R Community and promote the use of the R language. For more information about R Consortium, please visit: http://www.r-consortium.org. The R Consortium is very happy to announce RC RUGS, the R Consortium R User Group Support Program. We believe that user groups are a great strength of the R Community and we would like to do all that we can to encourage the formation of new user groups and to help existing R user groups flourish. The 2016/2017 RC RUGS program provides financial support for R User Groups based on their size and the frequency with which they meet. “Vector” level membership, appropriate for new and small groups, comes with a grant of $150 per year. Larger, established groups that have a track record of meeting frequently may qualify for “Matrix” or “Array” level membership with respective annual grants of $500 and $1,000. SAN FRANCISCO (Spark Summit) June 6, 2016 – The R Consortium, an open source foundation to support the R user community and a Linux Foundation project, today is announcing IBM is becoming a Platinum member of the project, which demonstrates a significant investment in the open source R programming language to simplify data analysis and statistical computing. By 2020, an estimated 1.7 megabytes of new information will be created every second for every human being on the planet (see: IDC study, Worldwide Big Data Technology and Services Forecast, 2015-2019). However, less than one percent of this data is ever analyzed for meaningful applications. Data scientists, for example, spend up to 70 percent of their time integrating and organizing data before analyzing and applying it toward critical applications like weather modeling or cancer research. The R language is a free and open source programming language used by statisticians, analysts and scientists to unlock the value from data. It provides an interactive environment for data analysis, modeling and visualization. The R Consortium aims to support the growing R user community and help ensure that the language evolves to meet new data challenges as they arise. As a global leader in data analytics and management, IBM has invested in software and technology solutions designed to help enterprises gain powerful insights from data. The company has relied on R, among other data languages, to help create innovative solutions like IBM Watson, an open, cognitive computing technology platform that represents a new era in computing where systems understand the world like humans do: through senses, learning, and experience. As a member of the R Consortium, IBM will collaborate with the R user community and support the project’s mission to identify, develop and implement infrastructure projects that drive standards and best practices for R code. As a Platinum member of R Consortium, IBM will gain a seat on both the Board of Directors and Infrastructure Steering Committee (ISC), helping to provide support and technical guidance to the R community. Dinesh Nirmal, vice president of development for next generation analytics platform and big data solutions, will join the R Consortium Board of Directors. IBM joins Platinum members Microsoft and RStudio and is also a Platinum member of The Linux Foundation. Today’s news furthers IBM’s commitment to advance Spark as the analytics operating system for accelerating innovation and driving analytics across every business. IBM continues to partner with leading data science organizations including Galvanize, H2O, LightBend and RStudio to promote an integrated and unified data science ecosystem. Additionally, IBM is joining the R Consortium to help accelerate data science’s readiness for the enterprise. The R Consortium is a 501(c)6 nonprofit organization and Linux Foundation Collaborative Project dedicated to the support and growth of the R user community. The R Consortium provides support to the R Foundation and to the greater R Community for projects that assist R package developers, provide documentation and training, facilitate the growth of the R Community and promote the use of the R language. For more information about R Consortium, please visit: http://www.r-consortium.org. SAN FRANCISCO – March 23, 2016 – The R Consortium, an open source foundation to support the R user community and a Linux Foundation project, today is announcing funding for seven community projects and the formation of two technical working groups. These milestones advance the R Consortium’s mission to support the R community through the identification, development and implementation of infrastructure projects that drive standards and best practices for R code. The R programming language provides an unparalleled interactive environment for data analysis, modeling, and visualization. R is a top-20 programming language (see: TIOBE Ranking Index), and its popularity is expected to grow with data demand. The R Consortium was founded to support the richness and diversity of the R community and to ensure that it continues to meet new data challenges as they arise. A Unified Framework for Distributed Computing in R: Many Big Data platforms expose R-based interfaces that lack standardization and are therefore difficult to learn. This project will develop a common framework to simplify and standardize how users program distributed applications in R, ultimately reducing duplication of effort. Improving Database Interface (DBI): Database access is an important cornerstone of the R ecosystem, but today’s specifications – data type transformation, return values, error conditions – remain vague and result in data analysis errors. This project aims to improve database access in R so that porting code is simplified and less prone to error. R Implementation, Optimization and Tooling Workshops (RIOT): RIOT 2016 is a one-day workshop to unite R language developers, identify R language development and tooling opportunities, increase involvement of the R user community and more. R Localization Proposal (RL10N): Although the R language is used globally, very few R packages are available in languages other than English. The RL10N project will make it easier for R developers to include translations in their own packages. Sat R Days: “SatRDays” are community-led, regional conferences to support collaboration, networking and innovation within the R community. Initially three events will be hosted, with plans for additional meet-ups as the R user base grows. Simple Features Access for R: Using the “Simple Features” standard supported by the Open Geospatial Consortium and the International Organization for Standardization, this tool will simplify analysis on modern geospatial data. Software Carpentry R Instructor Training: This two-day in-person training course will introduce the basics of R programming and address the growing demand for training resources for the R language. The R Consortium ISC awards grants based on the critical nature of the problem(s) being addressed; the solvability of work involved; the amount of financial aid needed; and level of community support. A community-wide call for proposals is now open until July 10, 2016. To submit a proposal or learn more information, please visit https://www.r-consortium.org/about/isc/proposals or email proposals@r-consortium.org. The R Consortium is also forming its first two working groups to facilitate collaboration and focus the community’s efforts toward two critical areas needed to advance the R programming language: standardization and best practices. Future-proof native APIs for R: This working groups will assess current native API usage, gather community input, and work towards an easy-to-understand, consistent and verifiable API that will drive R language adoption. Code Coverage Tool for R: Helping to improve software quality, the code coverage tool will address feature and platform limitations of existing tools while also promoting the use of code coverage more systematically within the R ecosystem. R Consortium is an independently supported software project hosted by The Linux Foundation. The Linux Foundation’s projects span the enterprise, mobile, embedded and life sciences markets and are backed by many of the largest names in technology. For more information, please visit:http://collabprojects.linuxfoundation.org.